I got to campus early today and saw a former student standing in a long line with friends and others - camping out in front of a store. "Concert tickets?," I asked. "U2? 40 Cent? (even 50 is downsizing in this economy)" "No." "Dorm room assignments? "Nah." "No, Yeezy. 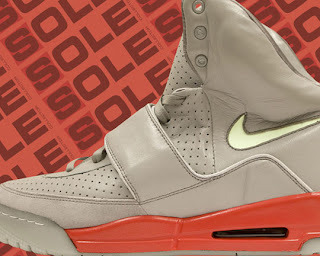 Nike Air Yeezy - Kanye West . Kanye -- Are you footing this student's tuition in the Fall? You can actually get them for the bargain of $600! That's a lot of rubber chickens! Heard you can get a good pair for 225 - but for that price, they should throw in Heat-Hawks tickets, and let me dunk over Harry the Hawk.